With the year almost complete, I've had a chance to reflect on my collecting over the past year. And while I have definitely slowed down when it comes to pickups (especially bigger ticket items) I can say with great confidence that I've made really good progress on my #WalletCard project. 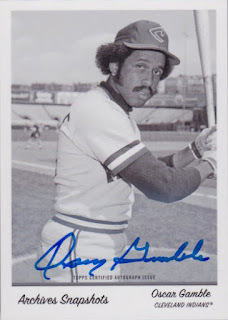 For two years my Oscar Gamble collection has grown considerably. Keeping in mind that I'm not rushing to get everything all in one fell swoop. I could very easily hit up COMC or Sportlots and snag the bulk of Oscar's cards out there. But where would the fun be in that? Instead, I've been pacing myself nicely....hoping to land a few cards locally (which I have) and taking a stab at some of the tougher or rarer cards when they show up. 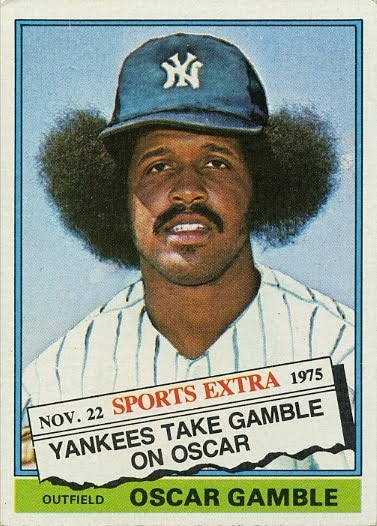 You've all seen my first true Oscar Gamble 1/1 and I'm hoping that it won't be the last. The card I'm sharing today is another tough find and I'm really happy to have landed it as well. One of the newest #WalletCard releases is Topps Archives Snapshots. A simple design (and a pretty good photo of Oscar's days with Cleveland) with a handful of parallels. This one is the tougher Black & White autograph limited to just 10 copies. Once again, I reached out to a fellow collector who has (numerous times) helped me save some shipping as he has a US address. Thanks Kevin!! I had let an even tougher parallel pass a couple months back and was kind of kicking myself about it. I'm glad to have hit this one at a fair price. With this pickup, I have officially hit the 50-card mark (out of a listed 162 cards) with another 10 incoming from COMC...likely before the end of the year. Not bad for a fun little project. Not bad indeed - that's some serious progress! Also, the blue ink on the b&w photo really makes the signature pop; sleek and classy looking card.